Today was actually a great sunny day, where we woke up this morning in Kalkrand and had breakfast with the local Pastor Beukes. At 10 o´clock we departed for Windhoek, turned in at Rehoboth to check the Ebenhaezer Congregation and we also greeted the congregation leader Pastor Tiboth. 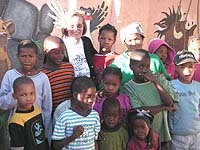 When we arrived in Windhoek we actually first comforted ourself at the Tabitha Centre and at 14:30 we were taken to orphanage houses here in Katutura by one of the retired teachers from Germany. We´ve seen the babies and the kids and it was really not good for me – because at that moment I felt like I am lost between two worlds. For one I thought that I am really happy to have a father, a mother, brothers, sisters, a house to live, food to eat and friends to be with daily – thanks to God for sparing me a healthy lifestyle. I really enjoyed everything today and I am really glad and happy to be with you guys – I´ll really miss you all!! !